Toxic Bar-1987 chestnut frame overo, splash and sabino Pinto. 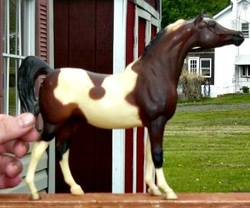 Sired by Barlink Macho Man (r) (Paint), out of Imastoxicone (arab). Also carries a Pearl gene from his sire. Black Lance-1993 black tovero. Sired by Bhr Hosens Lancer (r), out of Tolakha. 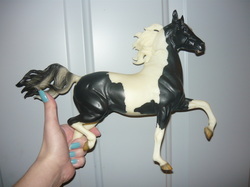 OF Breyer Trad, Black Tie. Desert Cream Bar-2003 palomino frame overo Pinto. Sired by Toxic Bar, out of Elektric Cream. 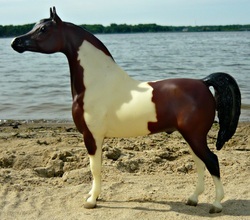 KSW Leviathan-2005 bay tobiano Pinto. Sired by KSW Spyro, out of Lady Druid (Arab). 87% Arabian. 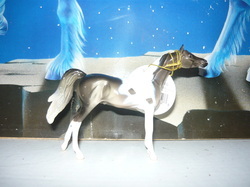 Charm The Dragon-2005 gray tobiano (black base) Piinto. Sired by KSW Spyro, out of Sultan's Charmer, Arab. 87% Arabian. 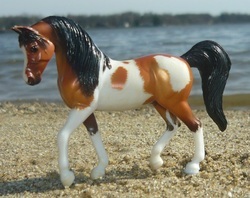 Willow's Mercedes-2009 bay tobiano Pinto. Sired by SA Risky Rampage-m, out of Mocha Doll Mine-m. Bred by Shadow Wolf Stables. Etched by Amanda Kennedy who sent him to me as a gift! Legionnaire-2013 flaxen chestnut tovero (tobi+sabi) and rabicano. Sired by Grand Vengeance (Arab)m out of Elektric Cream. 2017-Wicked King, flaxen chestnut tobiano colt (x Amal, Arab) o/b Shadow Wolf Stables.